It's hard to believe The Hunger Games franchise is coming to a close, though it seems Peeta confirmed there will be some type of spin-off or prequel in a few years time. What is strange about The Hunger Games series though is that I tend to care less about them in between installments despite having read all of the books and still being interested in the film adaptations. I was beginning to put together my most anticipated list for the fall movie season the other day and I completely forgot we had the finale to Suzanne Collins trilogy coming out. I don't know if this means I'm not really excited to see the movie or if in the three years since the first film premiered I've grown tired of these types of films. That said, I still get excited for a good super hero movie so who knows, maybe I'm really just not that pumped for it. Either way, you won't see it on my list despite this full trailer for the film looking nothing short of fantastic. 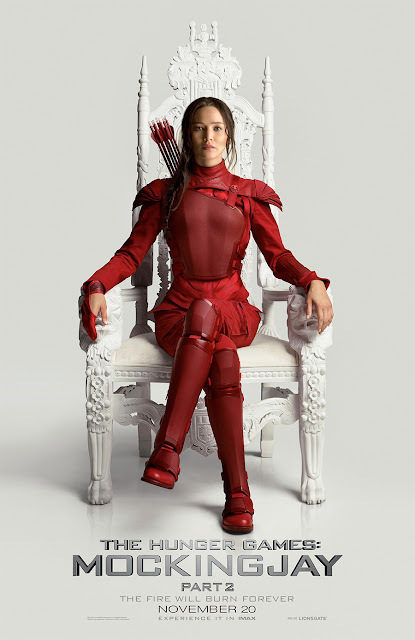 I guess it could be due to the fact I wasn't able to catch Mockingjay - Part 1 in theaters and thus it felt like less of an event, but I will still be seeing Part 2 in IMAX opening night as director Francis Lawrence has seemingly put together a worthy final chapter to the three rather solid films that have come before it. While Catching Fire is easily my favorite so far, Mockingjay - Part 2 may well in fact top it given it's the conclusion and it looks packed to the brim with both action and drama. Jennifer Lawrence, Josh Hutcherson, Liam Hemsworth, Woody Harrelson, Elizabeth Banks, Philip Seymour Hoffman, Jeffrey Wright, Willow Shields, Sam Claflin, Jena Malone, Stanley Tucci, Julianne Moore, and Donald Sutherland all return when The Hunger Games: Mockingjay – Part 2 opens November 20, 2015.